Recently I have gone through several woks. My first was a Tefal which served me well through uni, then when I really got into Wok cooking I visited my local Chinese supermarket and got myself a carbon steel wok that required seasoning. I then went for a large Wok with a lid, although its a great size I found it to hard to keep hot on my hob. So finally I went back to the carbon steel variety but this time I went for one of Ching He Huang's. I got it at the bargain price of £7.50 at Sainsburys and it really is perfect. Its big enough for what I need, Heats evenly and is easy to clean. To christen it I decided to try a recipe I haven't made before. 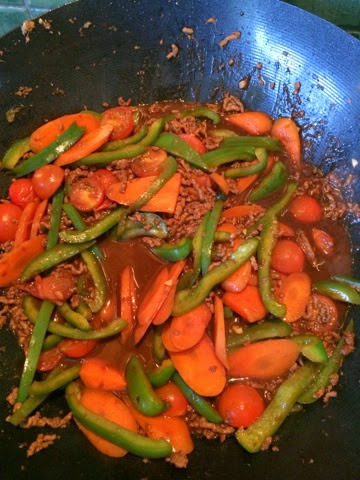 Minced beef and green pepper stir fry. Start by preparing all of the vegetables, chop the cherry tomatoes in half, the peppers into strips and the carrots on an angle (about half a cm thick. To make the sauce simple combine all of the ingredients in a jug, it is really important that the water is cold, warm water will cause the cornflour to clump and it will ruin the meal. 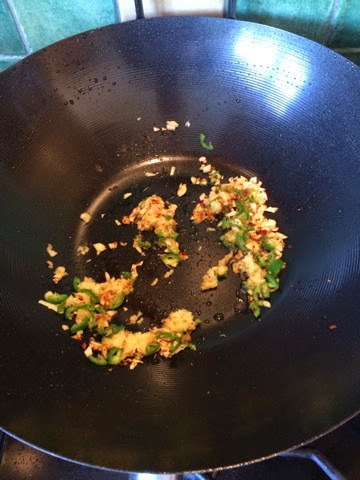 Place the Wok on the hob and allow it to heat until it begins to smoke. Add one tablespoon of groundnut oil and give it a swirl to cover the edges. 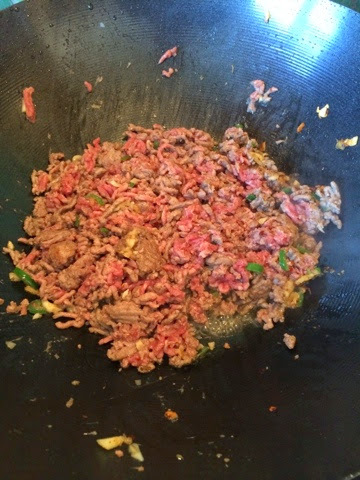 Throw in the garlic, ginger and chilli and stir it for a few seconds before adding the beef. 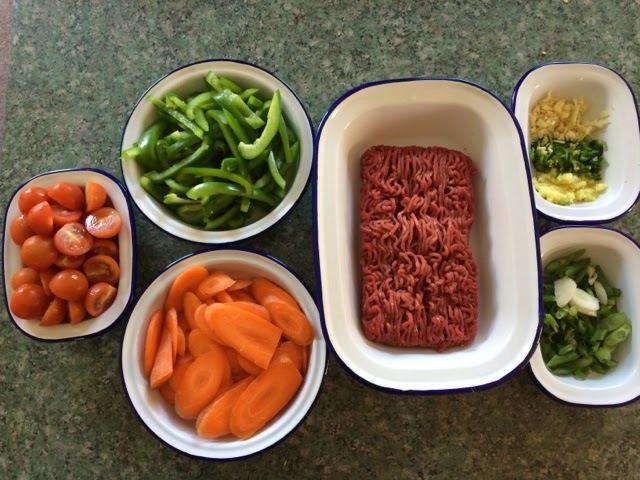 Stir fry the mince for a few minutes, breaking it up into small pieces. 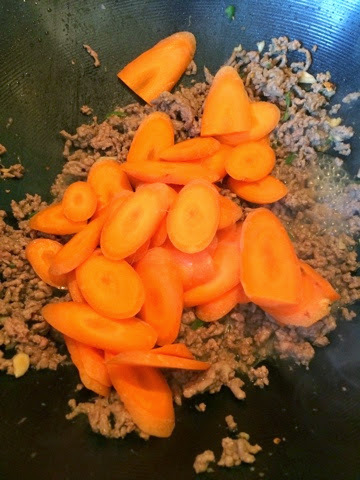 Once the meat has browned add the carrots. 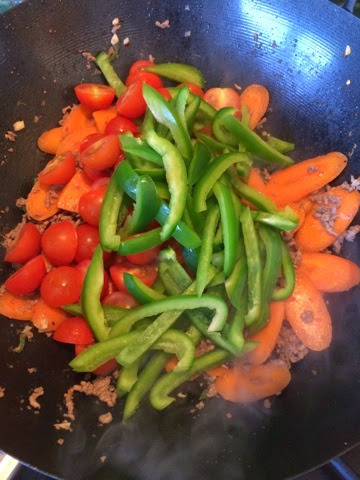 Stir fry these with the meat for 2-3 minutes. 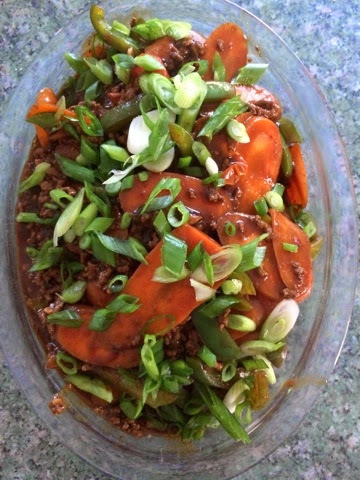 The Chinese like their vegetables to have bite to them and it really does add texture to the dish. Next add the peppers and tomatoes and stir for a minute or so before adding the sauce. The cornflour in the sauce will cause it to thicken when it hits the hot wok, making a thick glossy gravy. Allow it to cook together for a few minutes (Or until the veg is to your liking) before serving. To serve simple pop it in a serving dish and garnish with chopped spring onion. I served this with plain jasmine rice but you could add egg noodles to this dish if you like. If you like this recipe why not also look at this one for Kung Po chicken.